Safflower is a plant mainly grown for the oil in its seeds. This oil contains the highest amount [70%] of linoleic oil of any plant oil. Linoleic acid is known to benefit the skin in many ways. It moisturizes and hydrates the skin, correcting fatty acid deficiencies that cause dry, itchy skin. Due to the high amount of linoleic acid, safflower oil can be used to heal wounds, burns, and acne. Safflower oil also contains oleic acid [15%]. Oleic and linoleic acids combined can be used to reduce the appearance of scars and increase collagen production. BulkActives' oils are cold pressed, without the use of solvents or chemicals. Safflower, Carthamus tinctorius, is a plant mainly cultivated for its seed . It is considered one of the oldest crops grown by people . Among the riches found in the tomb of King Tutankhamun were garlands made from safflowers, recognized even in ancient Egypt for their restorative powers. The oil content of the seeds is about 20% . Safflower oil was used in ancient Egypt to heal old wounds . It is commonly used as a hair conditioner and in soap. In India, the oil is applied topically to heal sores and reduces pain associated with rheumatism . Safflower oil is non-allergenic and stable, making it suitable for cosmetic application. In addition, a clinical study showed participants believe safflower oil feels smooth after applied and is generally an appealing topical oil . The therapeutic power of safflower oil is due to its high fatty acid content. Fatty acids are known to have emollient properties, meaning they smooth the skin. Safflower has the highest linoleic acid content of plant oils, about 70% [1, 4]. Linoleic acid is an omega-6 fatty acid known to have many skin benefits. Linoleic acid treatment reduces skin water loss and protects skin barrier function. Burned skin has decreased amounts of linoleic acid. Thus, topical linoleic acid plays a role in treating burns, including sunburn . It can also help treat eczema, psoriasis, and acne. Decreased linoleic acid in sebum worsens acne, suggesting that topical application of linoleic acid can help heal acne . Also, linoleic acid is anti-inflammatory, as it decreases prostaglandin [immune mediator] synthesis. Safflower oil also has about 15% oleic acid, an omega-9 fatty acid . Oleic acid is ant-inflammatory and anti-oxidant. Both oleic acid and linoleic acid together reduce scar appearance, aid in wound healing, and increase collagen when applied to the skin [2, 6]. Essential fatty acids such as linoleic acid are fatty acids our bodies can’t produce on their own, meaning they must be supplemented either topically or through diet. Essential fatty acid deficiencies produce dry, scaly skin . They can cause hair loss, skin infections, and poor wound healing . Topical safflower oil has been shown to correct essential fatty acid deficiency. In a study using rats, safflower oil applied for 15 days increased the amount of linoleic acid in blood plasma, reducing essential fatty acid deficiency . In a clinical, safflower oil also prevented essential fatty acid deficiencies . Since linoleic acid is the most abundant fatty acid in the skin, oils with high linoleic acid content such as safflower oil are some of the most effective for treating fatty acid deficiencies. 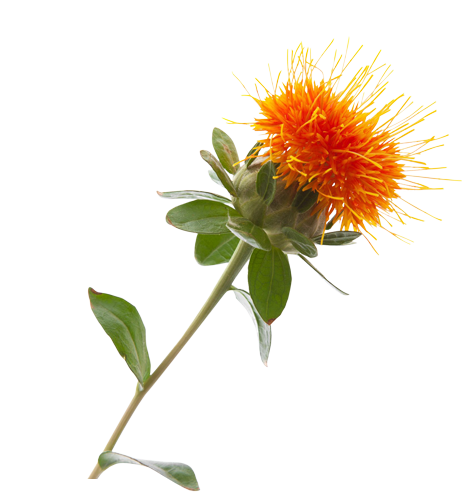 Generally, topical safflower oil increases skin moisture . Also, safflower seeds show activity for preventing pigmentation, showing they may have a role in preventing hyperpigmentation from sun exposure . M. Athar and S.M. Nasir, “Taxonomic perspective of plant species yielding vegetable oils used in cosmetics and skin care products,” African Journal of Biotechnology, vol. 4, issue 1, pp. 36- 44, January 2005. D. Banov, F. Banov, A.S. Bassani, “Case Series: The Effectiveness of Fatty Acids from Pracaxi Oil in a Topical Silicone Base for Scar and Wound Therapy,” Dermatol. Ther. [Heidelb], vol. 4, pp. 259- 269, 2014. H. Bohles, M.A. Bieber, and W.C. Heird, “Reversal of experimental essential fatty acid deficiency by cutaneous administration of safflower oil,” The American Journal of Clinical Nutrition, vol. 29, pp. 398-401, April 1976. B. Cosge, B. Gurbuz, and M. Kiralan, “Oil Content and Fatty Acid Composition of Some Safflower [Carthamus tinctorius L.] Varieties Sown in Spring and Winter,” International Journal of Natural and Engineering Sciences, vol. 1, issue 3, pp. 1-15, 2007. L. Dajue and H.H. Mundel, “Safflower. Carthamus tinctorius L.,” Promoting the conservation and use of underutilized and neglected crops. vol. 7. Institute of Plant Genetics and Crop Plant Research, pp. 1-83, 1996. A. Donato-Trancosoa, L. Goncalves, A. Monte-Alto-Costa, F. de Assis da Silvac, and B. Romana-Souza, “Seed oil of Joannesia princeps improves cutaneous wound closure in experimental mice,” Acta Histochemica, vol. 116, pp. 1169-1177, 2014. R.L. Goldemberg and C.P. De La Rosa, “Correlation of Skin Feel Emollients to Their Chemical Structure,” J. Soc. Cosmet. Chem., vol. 22, pp. 635-654, September 1971. D.F. Horrobin and B.M. DPhil, “Essential fatty acids in clinical dermatology,” Journal of the American Academy of Dermatology,” vol. 20, num. 6, pp. 1045-1053, June 1989.
parenteral nutrition,” The American Journal of Clinical Nutrition, vol. 46, pp. 419-423, 1987. J.S. Roh, J.Y. Han, J.H. Kim, and J.K. Hwang, “Inhibitory Effects of Active Compounds Isolated from Safflower [Carthamus tinctorius L.] Seeds for Melanogenesis,” Biol. Pharm. Bull., vol. 27, no. 12, pp. 1976-1978, 2004.